Except for those who are recruited through an assistantship program like those operated by the Spanish government (Cultural Ambassadors Program) or the British Council, the vast majority of opportunities to teach English in Spain will be gained by searching and interviewing for positions in-person locally on the ground in Spain. We highly recommend that you plan on being on the ground in Spain during September–early October and in January. Here are some great tips for finding opportunities to teach English in Spain. TEFL certification is # 1. The first thing you will need is a professional TEFL certification to be considered for an English teaching job in Spain. Don't bother showing up without it, you will have a sad trip home a few weeks later when no school will hire you without it. Go to Spain! The vast majority of language schools interview and hire new English teachers locally in Spain. Each year, thousands of foreign English teachers across Spain leave their jobs, creating a strong demand for new teachers. 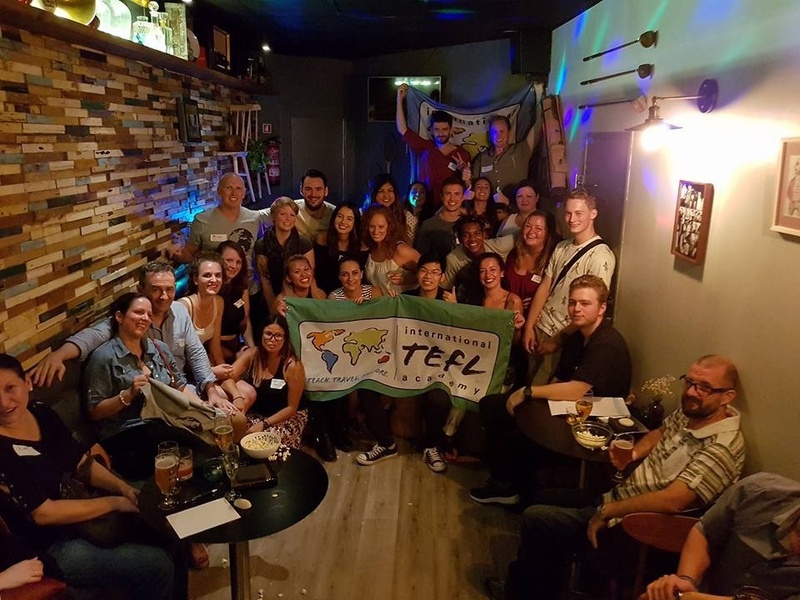 The prospect of going to Spain to interview without having a job lined up before you leave home may seem daunting, but every year virtually every International TEFL Academy graduate who goes to Spain to interview during major hiring seasons gets hired. Why? because the jobs are there, but you need to take initiative and go to Spain to get hired as an English teacher. Hiring seasons are critical. We highly recommend arriving in Spain to interview in mid-September and bear in mind that early October is the biggest hiring period in Madrid in particular. A second major hiring period begins in the second week of January and runs for several weeks. Go to the largest cities. Madrid is the biggest job market in Spain by far and we recommend it as the best place to begin your job search. Barcelona and Bilbao are also a couple of good options. If you do not have accommodations lined up such as family or friends, plan on spending your first month in a hostel or some other budget-friendly accommodations. Use resources such as Lonely Planet guides to find such venues. If you have friends or relatives in the city where you intend to get hired, have them scout out local schools before your arrival. Also, have them inquire with friends and colleagues to see if they might be interested in private lessons – this will enable you to start making money and getting experience as soon as you arrive. As soon as you arrive, get a local phone with a local number and make sure to include the number on your resume and in all correspondence with schools. Have your resume/c.v. and cover letter translated into Spanish. Also make business cards for yourself if possible that list you as TEFL-certified (and a native speaker if that applies). The most effective way to get interviews and get hired with language schools in Spain is to go to schools directly in-person to inquire about teaching opportunities. When you interview and go through the hiring process, expect to begin teaching immediately (i.e. within the week). Use resources like www.eslbase.com/schools/Spain to locate schools in the area where you seek to work (students and graduates if International TEFL Academy courses will receive contact information for hundreds of schools in Spain and thousands of schools around the world as part of their lifetime job search guidance). Other excellent resources for finding schools are in the Yellow Pages at (www.paginas-amarillas.es) and the Madrid Blue Pages (a directory organized by street address). While it’s not especially common for schools in Spain to recruit new teachers using ESL job boards, it’s still worth checking out sites like www.daveseslcafe, http://www.eslbase.com/jobs/ and www.eslemployment.com to find job listings and contact information for schools in Spain. Try to meet other local English teachers and learn as much as you can from them about the local job market. Try finding schools slightly off the beaten path away from the most chic and popular neighborhoods. Check advertisements in the local press (both English and Spanish), like La Vanguardia in Barcelona (especially the Sunday edition) and El Pais in Madrid. Do not hesitate to take one or more part-time jobs to start, it is common to hold two part-time jobs and it's a good way to meet more people and network. If you are American and want to teach legally one of the ways is to obtain a student visa by taking Spanish classes in Spain, the student visa allows you to work up to 20 hours a week, which is virtually a full-time schedule for teachers. View our Madrid Student Visa Programs and our Barcelona Student Visa options. Teach English Online. Whether you teach English in Spain or elsewhere, you can always increase your earnings and get a head start of setting up paid teaching hours by Teaching English Online. With demand for online English language instruction skyrocketing worldwide, teaching English online provides TEFL certified teachers with opportunities to earn extra pay at virtually time from anywhere in the world. Most teachers are able to make at least $10-$20 (USD) an hour & hours are very flexible. Another key advantage is that you can begin teaching and making money before you even head abroad, which is great for covering start-up costs of your move and ensuring that you can have an income pretty much right away when you get to Spain. To learn more, check out Teach English Online Your Guide on How to Make Money & Travel the World. Some camps and schools also recruit in the winter/spring for the following summer season. Most English camps in Spain will recruit local English teachers in Spain, but some will recruit using ESL job boards such as www.daveseslcafe, http://www.eslbase.com/jobs/ and www.eslemployment.com. Got Questions about Your Options for Teaching English in Spain? 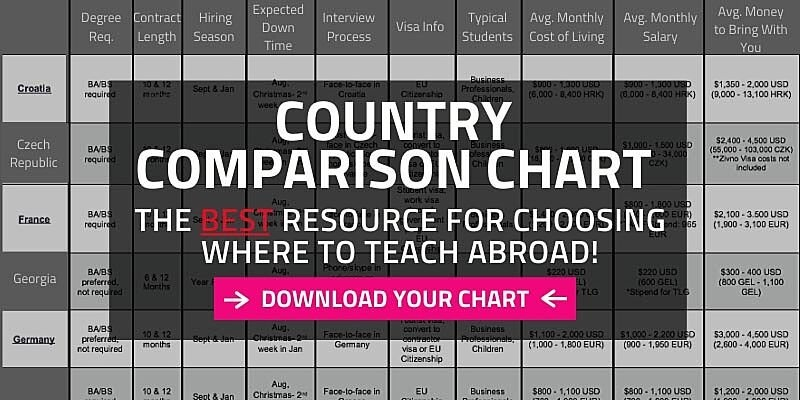 Request a free guide or call 773-634-9900 to speak with an expert advisor about all aspects of teaching English in Barcelona & around the world, including TEFL certification, the hiring process, salaries, visas and more!